"Over a thousand years ago, the wind, sea currents and stars brought people to the islands that became known as Aotearoa, the land of the long white cloud. Navigate your way through this sumptuously illustrated story of New Zealand. Explore the defining moments of our history, ca... read full description below. Over a thousand years ago, the wind, sea currents and stars brought people to the islands that became known as Aotearoa, the land of the long white cloud. Navigate your way through this sumptuously illustrated story of New Zealand. Explore the defining moments of our history, captured by celebrated children's book creator Gavin Bishop, from the Big Bang right through to what might happen tomorrow. Discover Maori legends, layers of meaning and lesser-known facts. A truly special book, Aotearoa- The New Zealand Story deserves a space on every bookshelf, to be taken off and pored over, thumbed and treasured, time and again. 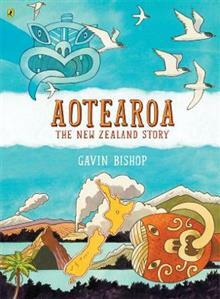 Gavin Bishop is a highly acclaimed children's book author and illustrator of more than 60 books, whose work ranges from original stories to retellings of Maori myths, European fairy stories, and nursery rhymes. Born in Invercargill, he spent his childhood in the remote railway settlement of Kingston on the shores of Lake Wakatipu. Studying under Russell Clark and Rudi Gopas, Gavin graduated from the Canterbury University School of Fine Arts with an honours degree in painting. He taught art at Linwood High School and at Christ's College in Christchurch. Among the numerous fellowships and national book prizes that have been awarded to Gavin throughout his career, highlights are his Te Waka Toi Nga Tohu a Ta Kingi Ihaka/Sir Kingi Ihaka Award in 2018, recognising his lifetime contribution to strengthening Maori art and culture through his children's books; The Arts Foundation's Mallinson Rendel Illustrators Award in 2013; and the 2000 Storylines Margaret Mahy Medal for lifetime achievement and his distinguished contribution to children's literature in New Zealand. Gavin was made an Officer of the New Zealand Order of Merit in 2013, and President of Honour of the NZ Society of Authors. In 2018, his book Aotearoa- The New Zealand Story won the supreme Margaret Mahy Book of the Year Award and the Elsie Locke Award for Non-fiction at the New Zealand Book Awards for Children and Young Adults. The judges praised it as being 'masterful in its execution - a work of art that bears repeated and thoughtful viewing and reading of its vibrant and informative illustrations. It is also a book of enduring significance in the canon of New Zealand children's literature - a landmark title which will stand the test of time.' That same year, Aotearoa won a Storylines Notable Non-Fiction Award and Best Children's Book at the PANZ Design Awards. In 2003 Weaving Earth and Sky won the non-fiction section and the Book of the Year Award of the NZ Post Children's Book Awards and was shortlisted for the LIANZA Elsie Locke Medal. Gavin has won the LIANZA Russell Clark Medal for Illustration four times- Mrs McGinty and the Bizarre Plant (1981); Kiwi Moon (2006); Rats! (2008); and There was a Crooked Man (2010). The judges of the 2006 Russell Clark Award said, 'Kiwi Moon has all the appeal and promise of a future folktale classic. It is an outstanding example of how text and illustrations can be interwoven to produce a marvellous whole.' Among his successful partnerships has been that with writer Joy Cowley, with whom he won the Best in Junior Fiction and Book of the Year at the 2008 NZ Post Children's Book Awards for Friends- Snake and Lizard. Other award-winning titles include- Mrs McGinty and the Bizarre Plant (Russell Clark Medal 1981); The Year of the Yelvertons (illustrator; the 1981 Esther Glen Medal); Mr Fox (Noma Concours 1984 Grand Prize); Hinepau (New Zealand Picture Book of the Year 1993); The House that Jack Built (Book of the Year and Best Picture Book at the 2000 NZ Post Book Awards); Friends- Snake and Lizard (with Joy Cowley, Children's Choice Junior Fiction, 2010 NZ Post Children's Book Awards); and Mister Whistler (written by Margaret Mahy, winning Best Picture Book at the 2013 NZ Post Children's Book Awards). Books that have been shortlisted for the NZ Post Children's Book Awards include- Stay Awake, Bear! in 2000; Tom Thumb in 2001 (picture book category); Taming the Sun in 2005 (also a finalist for the Russell Clark Award in 2005); Riding the Waves in 2007; Rats! in 2008; Piano Rock in 2009 (which won the 2009 PANZ Book Design Award in the children's category); and Cowshed Christmas in 2010. Many of Gavin's works have been listed as Storylines Notable Books, most recently Aotearoa- The New Zealand Story in 2018; also Tom Thumb (2002); The Three Billy Goats Gruff (2004); Taming the Sun- Four Maori Myths (2005); Kiwi Moon (2006); The Waka (2006); Te Waka (2006); Riding the Waves- Four Maori Myths (2007); Snake & Lizard (2008); Rats! (2008); Piano Rock- A 1950s Childhood (2009); There Was a Crooked Man (2010); Cowshed Christmas (2010); Friends- Snake & Lizard (2010); Counting the Stars- Four Maori Myths (2010); and Teddy One Eye- The Autobiography of a Teddy Bear (2015). Gavin's artwork has featured in exhibitions internationally, including Japan and Czechoslovakia. He has written and designed two ballets for the Royal New Zealand Ballet Company- Terrible Tom and Te Maia and the Sea Devil. In 2003 he shared the Ursula Bethell Residency with Catherine Chidgey. The Storylines Gavin Bishop Award for Picture Book Illustration was established in 2009 to encourage emergent illustrators and to acknowledge Gavin's contribution to the writing and illustrating of children's picture books. Gavin lives and works in Christchurch, New Zealand. See more about him and his work at www.gavinbishop.com.